Japanese traditional kimonos. However, I know AO`s for kimono are necessary in Second life. I think I`ve made a neat AO for kimono this time, especially the stands which I think are really awesome. Two walking animations are included. One is for western outfits and the other for Japanese Kimono. Outfits constructed from prim are increasing in SL, and you might sometimes find your AO interrupts the smooth fit of your clothes. It is one of my challenges for making AOs to allow the clothes to fit beautifully on your body. I think I have achieved that with this AO. Although this AO is for kimono, it will work well with prim heavy outfits too. Please come dressed up and try the demo in my stores. I’ve released a male AO called Mastiff. 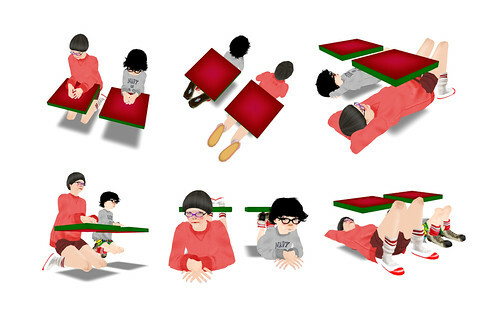 All the poses in this AO are static. I made this on a tial basis at first, but I found it very dignified. I’m going to make more AO`s with static poses in the future. I`m betting men who don’t like tottering about so much, will like this one. Please try the demos in the vendor in my shop. I have sent a Christmas gift to the update group members by group notice. 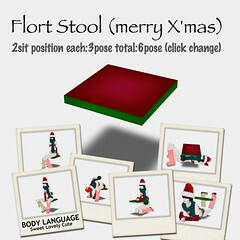 It’s a Christmas color stool with 6 poses included. You can get it from the notice history of SweetLovelyCute update group. 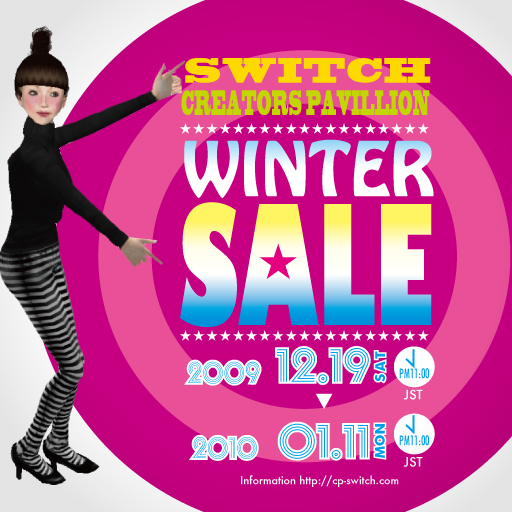 The Winter Slae of SWITCH & Creators Pavillion will start on Dec. 19(Sat. ), 2009 and end on Jan. 12(Mon. ), 2010. Body Language will take part in this event as a guest vendor. I will release a men’s AO exclusively in this event before its regular release from the end of this year. It’s quite static, a set of static poses for men. Please try the demo on the vendor stand before you purchase it. There will be a lot of charming stores joining this event. Please come visit SWITCH & Creators Pavillion.